This is my day off (or is that "off day"?). I went to the Cinema. I saw "Valkyrie", and was surprised at how good it is. In fact, in my opinion, it is excellent. 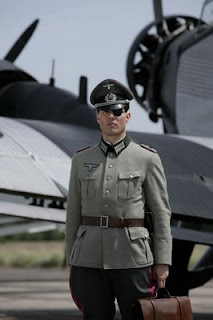 Tom Cruise plays the real-life character Colonel Klaus Von Stauffenberg. He eventually became the leader of the plot to assassinate Hitler (July 1944). The story is pure tragic-opera. There is no singing until the wonderful music at the closing credits, but Wagner has a part to play. Coming out of the cinema I was suprised to find myself moved (as they say). Questions arose as to how we are any better now than then. Whatever were the mixed motives of the conspirators (and they were truly mixed), whatever we may say about the mistaken way they went about their business, some of them, at least, were sickened by the continuing brutality of the war and, certainly, Stauffenburg was alarmed at the useless loss of life in the German Army. The film suggests that he was also concerned about the plight of the Jews, but there is no proof of that. Still, the question is unavoidable; are we any better now? Having seen a film like this, which is good enough to make me think about the horrors of Nazi Germany, and the plight of so many who wanted to live in peace and know the "good times" once again, I cannot help focusing on the tragedy of abortion. If governments uphold and promote the so-called right of parents to kill their own unborn children, can abortion be classed as a systematic act? Theologically I think there is a case to be made for this. If God "respects" the use of human authority - in the sense of "respecting" the freedom of will and the choice of citizens to agree with the rule of their governments - then what we have in legalised abortion is a systematic sentence of death against the most vulnerable members of human society. I have in mind Our Lord's words to Pilate; "You would have no power over Me unless it had been given you from above", and it is clear that the consequences of King David's sins could be visited on the people. No, we are no better. When we consider the dreadful sufferings of the people of Zimbabwe, and the situation in Gaza, we can easily admit that human lives are being used, abused and destroyed for the vain material and "political" ambitions of a few. The uniforms and vehicles have changed, the names look very different, the methods used are just as barbaric, (even if sometimes more refined), and brutality, torture, murder, false imprisonment and hatred are still with us, and they are just as bad - if not worse - than before. There is some concern that anti-semitism is still with us, but what we have in abortion is worse than that. This is not an attack against a particular people within the human race; this is fundamentally an attack on the human race itself. Just as much as the Nazi Party, it is the work of Satan. The unblinking inability to hear the truth of those who perpetrate this madness suggests the presence of another intelligence. It is the same as that which inspired the madness of Hitler, and just as well-hidden from the minds and hearts of the majority of people as it ever was. The light and truth of the Gospel have never been more needed.